The equipment maker's layoff plans will have little effect on its solar division. The company competes fiercely with Oerlikon in the amorphous-silicon sector. Applied Materials expects to cut only a handful of employees from its solar division and see its customers spending less on buying its thin-film equipment over the next year. The recession and the credit crunch, along with more intense competition from makers of different solar technologies, could squeeze sales for Applied's customers, said Christopher Beitel, managing director and general manager of Applied's thin-film division, at the Thin-Film Solar Summit in San Francisco this week. "I think we will see a short-term slow down. With the credit crunch we will see near-term pressure on our thin-film players," Beitel said. "We will see a capital equipment [expenditure] reduction, no near-term expansion." The Santa Clara, Calif-based company announced last month a plan to cut 1,800 positions, or 12 percent of its workforce worldwide (see After 45% Profit Drop, Applied Materials to Cut 12% Staff). Applied, a long-time developer of semiconductor-making equipment, also makes equipment for producing amorphous-silicon thin-film panels. 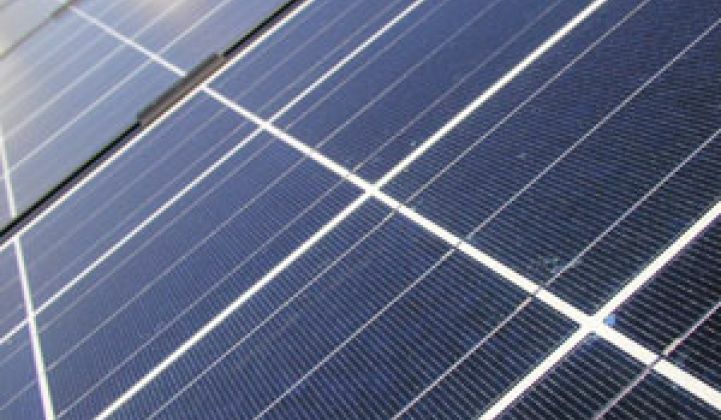 The solar division will suffer less than other business units because the company is counting on it to grow its sales, Beitel said. Applied can't afford to cut back, at least not much, when it faces tough competition fromOerlikon Solar in Switzerland. Both companies have lined up customers and shipped them equipment, but only a few have started volume production. Besides competing in the amorphous silicon field, customers of Applied and Oerlikon also have to compete with makers of other types of thin films. A slew of startups are developing thin films using copper indium gallium and selenium (CIGS), which promise to produce more efficient and cheaper panels than makers of the amorphous-silicon or cadmium-telluride variety (see Global Solar Uses Own Tech to Power Up Factory). All thin-film makers are gunning for a market currently dominated by makers of crystalline silicon panels. Although thin films can be made more cheaply, they are a lot less efficient at converting sunlight into electricity than thin films. The competition between crystalline silicon and thin-film factions will heat up, Beitel said. The prices for polysilicon are falling, leading to a lowering of crystalline silicon panel prices as well. Amorphous silicon panels are sold for roughly $2.50 per watt today, compared with $3 to $3.50 per watt for crystalline silicon panel, Beitel said. Despite cheaper prices, amorphous-silicon panels are not as efficient at generating electricity. Signet Solar, the first Applied customer that began commercial production a few months ago, is producing panels with an average of 6.5 percent efficiency. That means Signet's panel can convert 6.5 percent of the sunlight that hits it into electricity. When Signet switches to a more advanced set of equipment from Applied next year, it expects to increase the efficiency to 9 percent, said Rajeeva Lahri, CEO of Menlo Park, Calif.-based Signet. San Jose, Calif.-based SunPower, on the other hand, is making crystalline silicon panels with an 18 percent efficiency. Both Applied and Oerlikon have developed two types of equipment for making amorphous-silicon cells. The first and older type makes cells with one layer of amorphous silicon, a technology commonly called "single junction." A panel, which is the finished product, is made up of a flat sheet of cells. The second, more advanced equipment makes "tandem junction" cells, which have not only a layer of amorphous silicon but also a layer of microcrytalline silicon to boost efficiency. Oerlikon said panels made with its tandem junction technology can achieve a 9.3 percent efficiency (see Oerlikon Boosts Fab Line Efficiency). Its single junction technology can produce panels with a 7 percent efficiency. Applied estimates that the cost of producing panels using its tandem junction technology is roughly $1.50 per watt now. It expects the cost to drop to $1.20 per watt in 2009 at a factory running at near-full capacity, Beitel said. The company has six publicly known customers so far, including Signet. Applied expects all of them to start commercial production by the end of 2009, Beitel said. He said a few more customers that haven't been made public also will do so next year. According to a Greentech Media's thin-film market research report released earlier this year, Applied has sold thin-film equipment to 13 customers. One of its other customers, Moser Baer, said this week it plans to start commercial production this month (see Moser Baer Rolls Out Thin-Film, Builds Power Plant). Oerlikon has sold equipment to 10 customers, according to the Greentech Media thin-film market research report. One of them, Sun Well in Taiwan, began commercial production earlier this year using the single junction equipment (see Sun Well Rolls Out Thin Film Panels). On Thursday, Oerlikon said Inventux Technologies in Berlin became its first customer to mass produce panels using its tandem junction technology. The new manufacturing line, also in Berlin, will be able to produce up to 33 megawatts worth of panels per year.